Staff Council Meeting - TODAY! Staff Council's next meeting will take place on Tuesday, April 4, 2017, 12:05-1:30pm in Davis Center's Livak Ballroom. The agenda is available here. Remember, if you print any of the information found in Staffline, please choose the double-sided or multiple-page option on your printer to reduce paper usage. Vermont Ski and Sport - Special Employee Paddleboard Pricing, April 8 & 9. Experts will be on-site at the Davis Center. Become a Staff Council Representative! It's officially Spring, which is the season for Staff Council Elections! Being on Staff Council lets you make your voice be heard and to work toward real change to improve our university community. Among Staff Council's accomplishments are unlimited sick leave accrual, paid personal days, and the staff dental plan, nursing mother stations, and the Staff Emergency Loan Fund. If you're interested in working on behalf of staff toward our next big achievement, consider applying to be a representative! Many past representatives have cited personal and professional benefits of service such as improved leadership skills, collaboration skills, writing and organizational skills, and the opportunity to work together with colleagues from all across the university community. We hope you'll consider reviewing the 2017 vacancies to see if there is availability in your unit and applying for service. Let the Staff Council Office know if you have any questions about the application process or form. 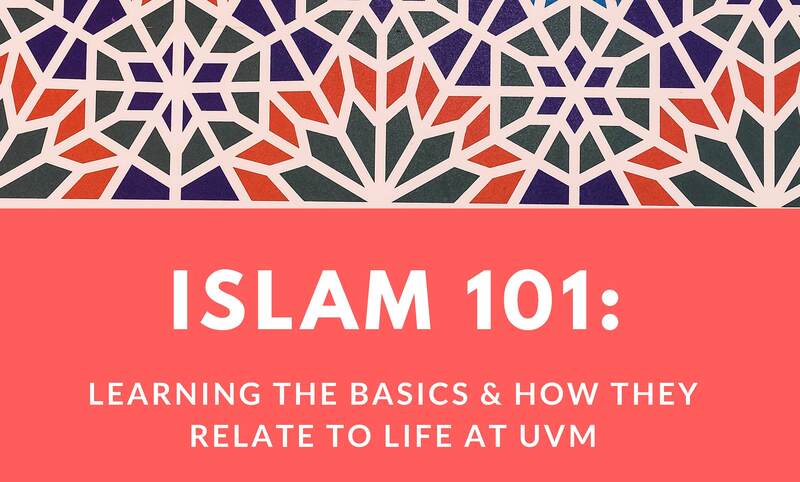 Learn key concepts, rituals and global and regional differences of the Islamic tradition from Dr. Ilyse Morgenstein Fuerst, Assistant Professor and Direct of UVM's Middle East Program. Explore and discuss how the campus environment can present challenges to students, staff and faculty who follow this faith. REGISTRATION IS REQUIRED - SPACE IS LIMITED. This class is restricted to current UVM staff and faculty only. Please register through Peoplesoft, for more information continue reading. . . .
Staff Council Leadership is delighted to announce the first Staff Women's Forum! On April 11th, join us in the Silver Maple Ballroom for breakfast and a morning of professional development, networking, wellness, and an opportunity to let us know about any challenges you've faced. The Staff Women's Forum will take place from 9:00 AM - 12:00 PM. 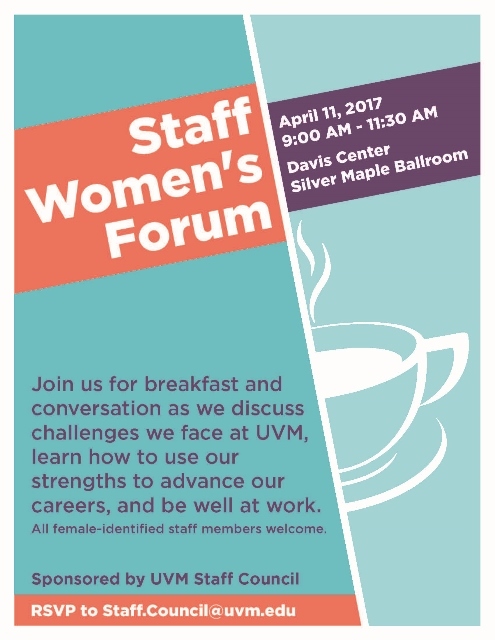 This event is open to all female-identified UVM staff members. The Forum is currently at full capacity, but we expect to have a few cancellations! Check out the programming and request a spot on the wait list here. Let us know if you have questions or would like additional information.